Holiday Island is home to both an 18 hole championship course and a 9 hole executive course. Thats a total of 27 holes nestled in the majestic beauty of the Ozark mountains! 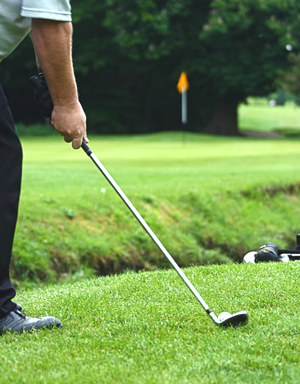 With daily, weekly and monthly rates, you can golf a little or a lot! Holiday Island offers sponsored golf tournaments and is the perfect spot for your next group vacation. Nearby Eureka Springs offers a wide variety of group lodging options. The Basin Park Hotel, in downtown Eureka Springs, Arkansas has the Play All Day – Unlimited Golf For Two as well as the 1 Night Golf Package. The Crescent Hotel, at the top of Eureka Springs also offers Play All Day – Unlimited Golf For Two as well as the 1 Night Golf Package. Surrounded by beautiful mountain views, the Recreation Center is the perfect place to relax in the pool, play a game of horseshoes and more. Click here for a full list of Holiday Island Amenities. Situated in the middle of Table Rock Lake, Holiday Island boats a marina, and several lake access points. The fishing couldn't be better, and this lake is a popular destination for swimming, sailing and more! The Holiday Island Campground is located in the woods of Holiday Island, but within a short distance from the marina, golf courses and amenities! These campsites have full water, sewer and electric with 30 and 50 amp hookups.